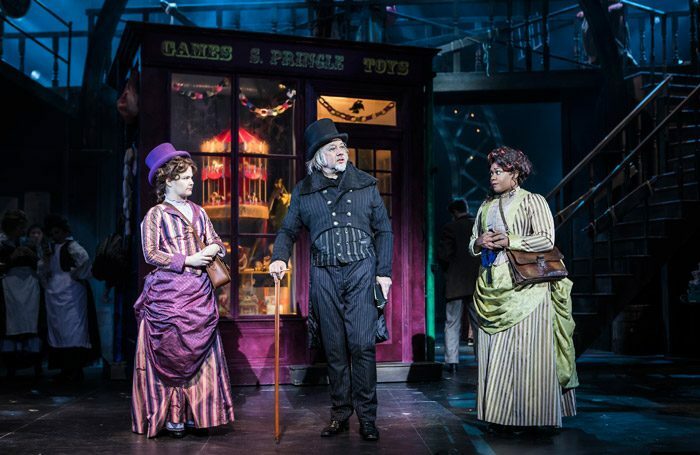 In his revival of Leslie Bricusse’s 1992 musical, Nikolai Foster exploits all the scale and technical wizardry of Curve’s vast stage, filling it with jolly Cheapside traders one minute and visions of hell the next. Much is owed to Michael Taylor’s spectacular set design, which flies in everything from Scrooge’s towering desk in the counting-house to the forbidding furniture of his lodgings. Jasper Britton’s titular miser is a coiled spring of anger, spitting out the song I Hate People with venom. This isn’t some enfeebled old man but someone in his 50s with enough time ahead to redeem his past. He delivers his tirades against the poor with relish but his body language and the workings of his face when he’s a mere observer also tell a convincing story. The show is deliciously high on melodrama. Fog swirls, tormented souls whip chains in hell, Karen Mann’s wild-eyed Marley chills to the bone and Anton Stephans’ rich-voiced Ghost of Christmas Present descends like a vengeful angel. The best numbers are the robust and exuberantly choreographed knees-ups like The Milk of Human Kindness and Thank You Very Much, delivered with warmth by Tom Jenkins (Danny-Boy Hatchard) and the street traders. While it definitely has the feel-good factor, the show’s moral message feels applicable to our times.